With so many flagship smartphones offering similar levels of performance and hardware, choosing one can come down to factors such as price and battery. Now, thanks to a study by Tom’s Guide, we know which handsets stand apart from the rest when it comes to charging speeds. The tests recorded the battery life of each phone after 30 minutes and 60 minutes of charging. The handsets were turned on but the screens were off, and they started with 0 percent battery. The fastest phone was the excellent OnePlus 5T. Its 3300mAh battery was at 59 percent after 30 minutes and 93 percent—almost full—in just an hour. The majority of critics have praised the handset, and at $499, it easily won the ‘Best Smartphone for less’ category in our Best of Smartphones feature. 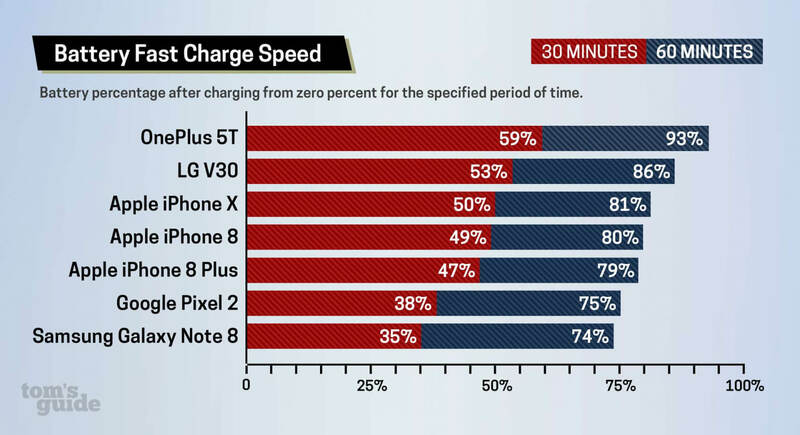 While it may not be on quite the same level as flagships from Google, Samsung, and Apple, LG’s recent V30 has them beat when it comes to battery charging times. 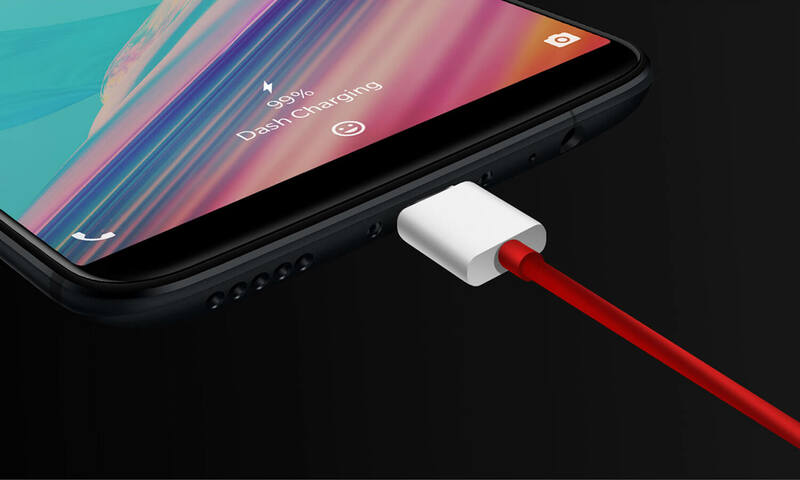 Like the OnePlus 5T, it also has a 3300mAh battery; one that reaches 53 percent after half an hour and 86 percent after an hour of charging. Next up are the iPhones, but their positions come with a major caveat: The Android handsets were tested using their included fast charging accessories—something that isn’t bundled with the latest iPhone models. Owners of the iPhone X, 8, and 8 Plus who want to use the feature need to buy a separate 29-watt power adaptor and a USB-C to Lightning cable, which costs around $68 altogether. Using the fast charging equipment, Apple’s handsets were comfortably ahead of the Pixel 2 (2700mAh) and Note 8 (3300mAh), with the top performing iPhone X (2716 mAh) hitting half its battery capacity in 30 minutes and 81 percent after an hour. The iPhone 8 and 8 Plus were in fourth and fifth place, respectively. Cupertino might be pleased that it was ahead Samsung and Google, but it’s a very different story when using the iPhones’ included adaptors. The lack of fast charging means the phones drop to the bottom of the table. All of Apple’s handsets take a hit, the worst being the iPhone X. Standard charging sees it reach just 17 percent after 30 minutes and 37 percent after an hour. Ultimately, this is a big win for the OnePlus 5T, especially as it’s around half the price of the iPhone X. Fastest charging also means the fastest draining and shortest battery life. well that was quite a reply, replete with facts and so well arugued who wouldn't be convinced? Stupid article and title just to initiate an Android vs Apple war. There is a reason why Apple don't include a 2A USB charger to the iphones. It reserves the 2A charger to the ipad because of the big battery it has. the iphone also don't need a lot of juice because of their superior power management optimizations. You can use 2A or greater provided you know that its a fact that when you charge your battery with big amps chargers, it is the fastest way to kill the battery. As a result, your battery performance will take a hit noticeably after a year. You will charge more often as a result of the battery degradation. So having the fastest time to charge is just a number game to people who can't put their phone behind for a couple of hours in a day. This is something that most people never think of. Quick Charge 3.0, let alone 4.0, is much finer tuned than 2.0 for example. And then of course Dash Charge is known for unloading heat away from the battery itself while charging. Whats funny though is that Samsung Galaxy S8 seems to use Quick Charge 2.0 to charge. Not sure why. Reehahs and Burty117 like this. Quite interesting to see Sony going for the opposite approach where the phone is deliberately charged slowly to enhance the lifespan of the battery. I'm writing this comment on a Sony Xperia XZ Premium, it has Quick Charge 3.0 and is one of the fastest charging phones I've owned. What it does do though, is learn your charging patterns and it holds the charge at 90% until about an hour before you wake up and trickle charges the last part. Whats funny though is that Samsung Galaxy S8 seems to use Quick Charge 2.0 to charge. Not sure why. Edit: Sony call it "Battery Care" in the options menu if anyone wanted to Google it and find out why Sony does this. Reehahs, Agnomen and Humza like this. Faster charging is great but does it cause the battery to lose capacity earlier, I have a feeling the bigger fish are just being a bit more cautious.